Think you've got a major project on your hands? Try accounting for the nation's more than 294 million citizens, which is the Census Bureau's mission in life. Tallying the U.S. population, mapping it and breaking it down takes significant planning. Project management is nothing new, nor is the fact that computer software can help manage projects. But like other enterprise IT functions, project management has taken on new dimensions; in the Census Bureau's Geography Division, those dimensions include opening the process to collaborators and incorporating cost controls to comply with federal mandates. "Our planning branch used to be mostly about coordination, making sure the left hand knew what the right hand was doing," said Brian Scott, chief of geographic programs in the division's project management branch. "We acted as a liaison for our customers, but we're trying to change that." Although the geography group is a service division in Census, its work touches organizations not only throughout the bureau, but also throughout other federal agencies. It provides reference files, maps and other data to Census divisions and other federal agencies. A year ago, the Geography Division formed a project management branch to better coordinate the work of its 20 offices and nearly 400 employees and contractors. Instead of acting as a liaison, the Geography Division wanted to step out of the way, concentrate on its services and let project managers better handle their teams. By elevating the function of project management, the division was also contributing to bureauwide efforts to raise its Capability Maturity Model level, Scott said. CMM, developed by the Defense Department-sponsored Software Engineering Institute, reflects an organization's use of best practices in software development. "The direction we're getting from Commerce is that we have to go this way," Scott said. "We were managing projects somewhat ad hoc in the past." The Geography Division's work with the Decennial Management Division, which carries out the census, spurred efforts to improve project management. For the 2000 census, the Decennial Management Division and several other parts of the bureau had adopted Primavera Project Planner software from Primavera Systems Inc. of Bala Cynwyd, Pa. The Census groups used the software primarily to catalog and schedule various parts of the massive project. But after the 2000 census, as the agency prepared to tackle new initiatives, it went looking for new capabilities. The Geography Division wanted more than a planning and scheduling tool. It needed a system that let more users have secure Internet access and could feed business case information into the bureau's Exhibit 300 forms, used for major capital spending plans, for the Office of Management and Budget. "We were looking for modules that had to do with earned value and risk management so we could contribute to the bureauwide" Exhibit 300 process, Scott said. After testing several project management systems, the Geography Division decided to upgrade to Primavera IT Project Office software and hired LaborLogix Inc., a McLean, Va., solutions integrator, to implement the system. "It was more than just an opportunity to move to a new platform," said Tim Hart, a senior account executive at LaborLogix. 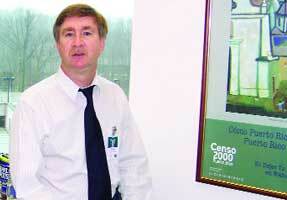 "It was a chance to get more [census] branches involved in project management." Through a Web interface, Primavera IT Project lets users outside an agency, such as federal workers or contractors, track projects and contribute information. Scott said Census is using the software to help manage an eight-year, $200 million project with Harris Corp. to modernize its master address file and topologically integrated geographic encoding and referencing database system. The Geography Division has about 35 active projects running on its Primavera system, including components of major cross-agency initiatives, such as Geospatial One-Stop. The software also includes the Primavera Cost Management module, which combines cost and scheduling data to generate budget forecasts and measure earned value. Earned value management, which relates resources to schedules, is an increasingly important part of project planning as agencies look to maximize the performance of their contractors. Hart said EVM and Exhibit 300 issues were the biggest areas of interest at last month's Program Management Institute Global Congress in Anaheim, Calif.
"Government is one of our fastest growing industry segments," said Michael Shomberg, vice president of marketing at Primavera. "The biggest challenge agencies have is getting their actual costs and their project data to match up." Several integrators, including Boeing Co., Lockheed Martin Corp., Northrop Grumman Corp. and Raytheon Co., use Primavera software to manage government projects, Shomberg said. Likewise, several agencies, including the departments of Defense, Energy and Veteran Affairs, and the Office of Personnel Management have purchased Primavera applications. Partners: LaborLogix Inc., McLean, Va., Primavera Systems Inc., Bala Cynwyd, Pa. The Census Bureau's Geography Division was playing middleman on many of the projects it contributed to in Census and among federal agencies. Having adopted project management software before the 2000 census, the division wanted to expand its capabilities. The Geography Division needed a solution that could take on two major challenges: Give non-division project participants access to the system, and feed data back into the Census Bureau's business case planning, as required by the Office of Budget and Management. After testing several solutions, the Geography Division decided to upgrade its Primavera software system to Primavera IT Project Office. The new system lets collaborators access the system via the Internet, and it supports earned value management, a scheme to map project resources to schedules to improve performance. The Geography Division has made project management its own branch in the agency to spur adoption and train project managers to use the software. There are 35 projects in the system, including an eight-year, $200 million project with Harris Corp. to modernize critical database systems. Brian Scott, chief of geographic programs in the Census Bureau's Geography Division, said the planning branch was mostly about coordination. Now it's helping other Census divisions with project management.